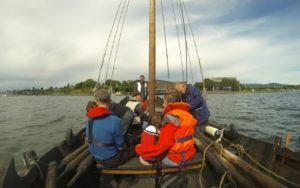 As part of the working exhibition ‘If I were The Ocean‘ at the Norwegian Maritime Museum Aug 2016, “Kystlaget Viken” (Oslo’s local team of the Norwegian Coastal Federation) organised a trip from the museum to the island of Lindøya with the re-constructed Viking ship “Vaaghals” (Dreadnought). ( ⇒ ?). The sailing vessel was of a kind used before 1628, constructed as a merchant vessel with ample place for all the passengers participating in the trip. For those interested in the original vessel it was excavated as Barcode 6. Sounding like a kind of drink from a bar, but in reality a very muddy excavated wreck from the Bjørvika in Oslo. Dancers, choreographers, academicians and visitors, some of them small children, made up a truly mixed bunch of different nationalities and interests. 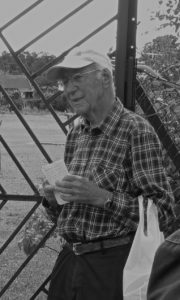 At Lindøya we were guided by Odd Myran, an active old-timer of 88 years who had spent time at the island since his childhood. He had fished, hunted, sailed and used other vessels around the islands since long before the Second World War. Odd is truly a part of the historical heritage of the island as well as being well-read on the history of the island. Proudly he shows us the elevated point of the Lindøya meridian. Greenwich in London and Lindøya were both used as points of reference for map making and navigation since 1833. In the case of Lindøya it was used for mapmaking from the observatory at Solli in Oslo by professor Christopher Hansteen (1784 – 1873). Odd has numerous details about the history of the island – the old Norwegian- Swedish King Oskar II who lived from 1829 – 1907 was rumoured to have his lover in a cabin at the island. At the very least she was his very close friend and he frequently visited her. 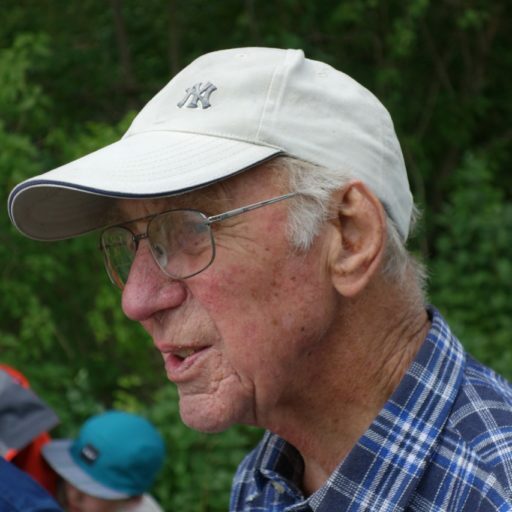 Having a guide with such immense knowledge, every house and part of the island triggers off memories ranging from frogs that hatch, to berries to pick, the fish, lobster and crabs in the sea, the old shooting range at the island, the still operating wharf and the pond constructed by one of the pioneers in the Norwegian film industry. A surprising Hollywood scene for romance and dancing in the middle of the interior of the island. Today with a mini golf range added, a fiercely territorial couple of swans and few ducks. “Idyllic island in the Oslo fjord with about 300 summer cottages in red, yellow and green. Southwest on Lindøya you find the best places to go swimming, and in the middle of the island there us a small shop and a football field”. Such is the words of the English website describing the island. The cabins were originally all labor cottages built by workers at the yards in central Oslo sometime after 1900. In the beginning people just built with scrap wood from the yards. From 1922 the building of cabins on the island was regulated by the public. Many of the cabins are still owned by the families that originated from the workers from the yards, but today the cabins are sold on the open market and very fashionable, accessible by a short passenger boat trip from the very centre of Oslo. Odd knows the history of all those cabins – the people who have inhabited them – their supposed secrets, the rumours and gossip. The community is still close knit and the island is today a nature reserve as well as a place of recreation. In earlier times the workers and their families moved with all their belongings by boat to the island each spring. Bringing their bed clothes and cutlery and having their children fishing during the summer. Today the poverty of the past is no longer visible, still the size of the cabins are regulating in such a way that it is the size of just enough for a workers family – the luxurious big cabins and summerhouses seen elsewhere along the coast are just not allowed. The only exception being the former resident of the suspected lover of the King – a large summerhouse built away from all others – a discreet place easily accessible from the summer castle Oscarshall. A King and his lover, one of the pioneer scientists of Norway and his point of meridian, workers from the yards and their families, at one time the main shooting range of Oslo, a place of fishing and hunting, a nature reserve and a wharf, a Hollywood scene and mini golf. Sometime before, the students of choreography, professor Amanda Steggell and myself had a workshop by the pond. We were watched by birds, frogs and the occasional passer-by. It was outside of the summer season when the island is most active, and their were few people to be seen – the island is mostly left alone outside of this season. That is when Odd is harvesting his lobsters and making his biggest catch of cod. An old man with his boat at sea. Harvesting like generations of people long before his time.